Estonia’s Elcogen has been selected to supply its innovative solid oxide fuel cell (SOFC) technology for the EU Horizon’s REFLEX Smart Energy Hub program. REFLEX is a cross multidisciplinary consortium featuring nine organisations from Denmark, Estonia, Finland, France, Italy and Spain. The Smart Energy Hub will demonstrate fuel cell and stack development and testing (Elcogen, CEA, DTU), power electronics (USE, GPTech), system design and manufacturing (SYLFEN), system modelling (VTT), field testing (Envipark); and techno-economical and market analysis (ENGIE). Elcogen will manage an energy hub coupled to solar and mini-hydro renewable sources to provide both electricity and heat to the nearby technology park. 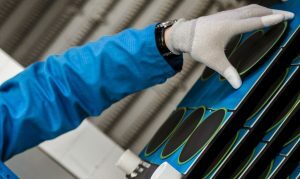 The company’s SOFCs will either operate in electrolysis mode (SOEC) – to store excess electricity to produce hydrogen – or in fuel cell mode (SOFC) when energy needs exceed local production, to produce electricity and heat from H2 or other locally available fuel.